The flexibility of Dorner’s new SmartFlex conveyor makes them adaptable to many different kinds of spaces. Not only can they make tight turns, but the SmartFlex can also go up and down steep inclines. The conveyor above had an incline of 45 degrees and reached 7 feet 10 inches at the highest point before dropping back down. Because of the inline, this conveyor was fitted with a cleated belt which ensures that the product was able to move up smoothly. This application is moving product that has moisture. In order to prevent machines (or people) underneath from getting wet, we attached drip pans with drain plugs to the underside of the conveyor. There are a variety of reasons that a conveyor of this type could be useful in your environment. The SmartFlex is a great conveyor for saving valuable space in your shop. If you have equipment already in place, an LPZ conveyor can make use of the room overhead instead of taking up more floor space. 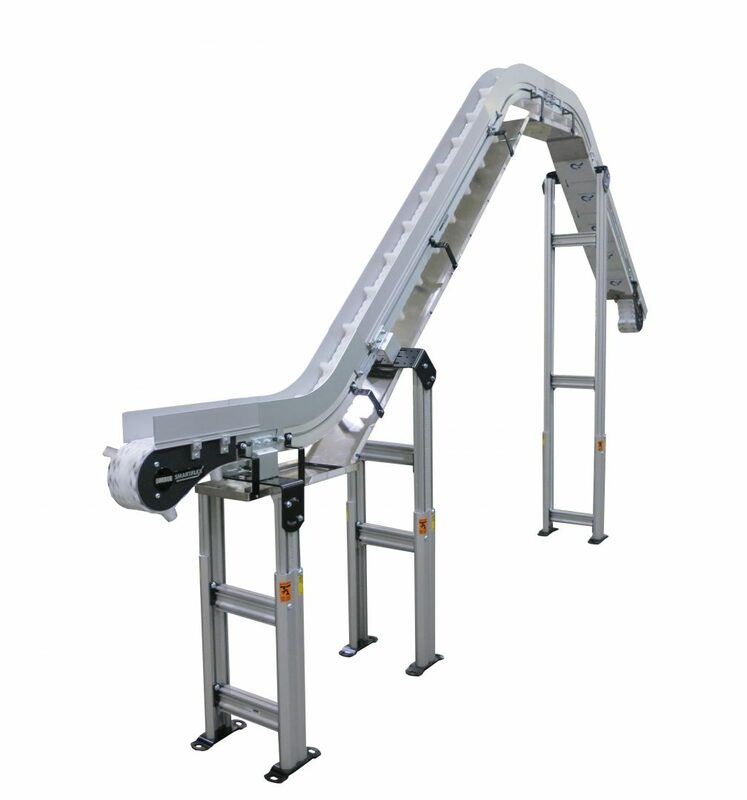 Another advantage of this conveyor is its ability to reach across the width of the room while still allowing room for operators to move beneath it. Learn how you can find a conveyor to fit your application on our Engineered Solutions page.